My favorite Steven Wright joke: "I have a map of the United States--actual size." But what really is the largest road map? It's 130 by 166 feet... created for the 1964 World's Fair. Sadly it's fallen into disrepair although I did see it featured in an episode of CSI New York not long ago. You can read more about it here... or here.... and efforts to restore it here. 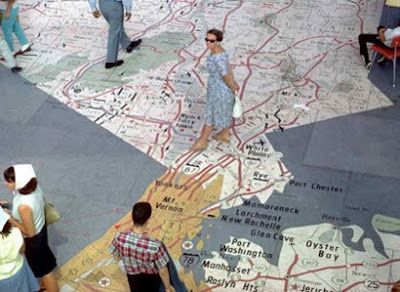 "Lost States" is all about thinking creatively about the U.S. map. Most entries in the book ponder adding new states, but what about subtracting? Specifically, why not eliminate Idaho? I think most Idaho residents would actually be in favor of the idea. People from Idaho Falls and all of eastern Idaho have close ties to Salt Lake City and the Mormon church... and they'd love to be a part of Utah. Residents of Idaho's panhandle already look to Spokane, Washington as their hub. And the fancy folks of Sun Valley desperately want to be in a liberal-minded state like Oregon. My proposed map makes it all happen. I even threw a bone to Montana, giving that state Island Park and the surrounding area. Because everyone knows that once you go up the Ashton Hill, you're really in Montana (if you've been there, you'd understand). And the solid Republicans of Idaho would likely be in favor of the idea, because it saves money by minimizing duplication in state government. If you think this is all quite silly, remember there is historic precedent. 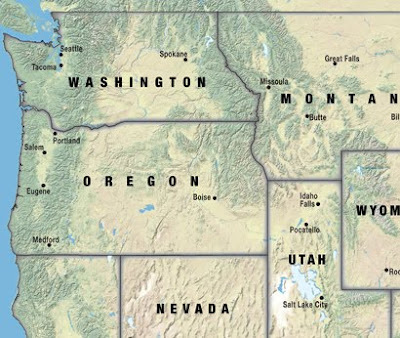 Idaho once included a large chunk of what is now Montana, until a state leader gave it away. I'm just suggesting we continue the effort to its logical conclusion. If you'd like to see a bigger version of the map, go here. Snow in all 51 states? You've probably seen news reports that 49 states had snow on the ground in recent days--with Hawaii as the lone holdout. But Hawaii actually DID have snow... and it's not all that uncommon on the islands. (See the satellite image above.) 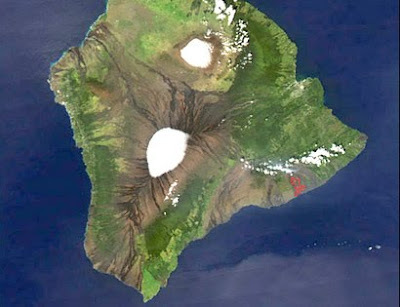 Those volcanoes go up pretty high, and some intrepid goofballs actually ski in Hawaii (which makes about as much sense as mountain climbing in Iowa.) So if 50 states can have snow simultaneously, what about 51? That is, if Puerto Rico ever becomes a state, could they join the snow club? Most meterologists would say no... unless you count the bizarre event documented in this old newsreel. Should Vancouver be in the U.S.A? The Olympics are starting up in Vancouver... time to revisit a question debated often over the last 200+ years: Should Vancouver be in the U.S.A? Back in the early 1800s, Americans thought so, and even threatened war with Canada. The non-catchy slogan was "54-40 or fight! "meaning the U.S. wanted nearly all of British Columbia—by pushing the border to 54 degrees, 40 minutes. (I would have suggested "55 or you don't get out alive!") In more recent years, the idea has come up again--especially whenever Quebec threatens secession. 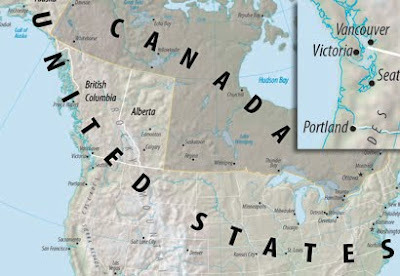 Because if Quebec secedes from Canada, many of the remaining provinces might ask to join the U.S.... hence the proposed map above--which would make the Vancouver Olympic Games an American event. If you're suffering from the recent mega-storms, take solace--at least you don't live in Greenland. America has been trying to buy the icy island since the early 1800s. We haven't succeeded (it still belongs to Denmark), but there is an American outpost there. Yep, the Danes rent us the land for Thule Air Force Base absolutely free. 750 miles north of the Arctic Circle. I had to chuckle when I read the Base's media guide--offering "tips for when you visit." Who would go there? Apparently, they think you'll go to golf. Check out the photo. It's their golf course! 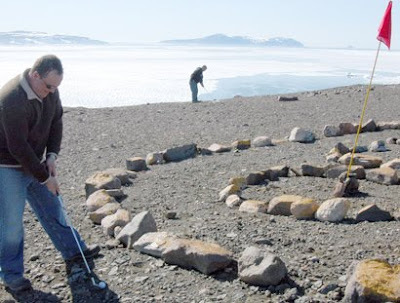 This may be the only place on earth where Tiger Woods can golf undetected. Wait, Greenland's owned by the Scandinavians... Tiger's wife probably has relatives there. Saints win. But who is the biggest loser? After Green Bay, New Orleans is the smallest city to have won a Super Bowl. And given that the Green Bay Packers are Milwaukee's team too, New Orleans really ranks as THE smallest city to have won the big game. 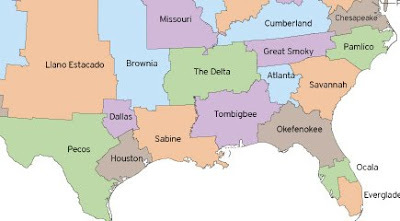 So here's the quiz: What is the largest U.S. city to have never had an NFL franchise? Los Angeles is the biggest city that currently has no NFL team, but what's the biggest city to never have had an NFL team? The map above is a hint. Answer: San Antonio. Conan and Jay: coincidence or conspiracy? The Conan and Jay conspiracy must be brought to light. 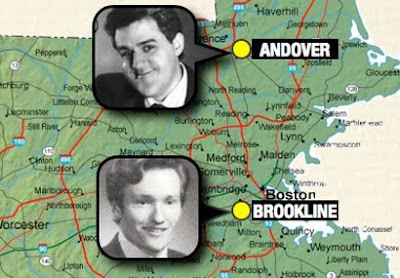 Consider this: The two grew up down the road from each other (see map). The mascots of both of their high school teams are the "warriors." At about the time Jay was asked to leave the Tonight Show, the two high schools played in a major championship game. Jay's Andover Warriors were upset by Conan's Brookline Warriors 65-58. The name of the game: The Comcast Tournament Championship. Comcast of course, is trying to buy NBC. Is Jay's takeover of the Tonight Show simply payback for a stunning upset in a major basketball grudge match? I'm not sure, but the conspiracy theorists now have a lot of material to chew on. With the new Wolfman movie coming out... and the neverending Twilight saga, it's worth revisiting the traditional home of the baddies: Transylvania. But you don't have to go to eastern Europe; look no further than Kentucky. 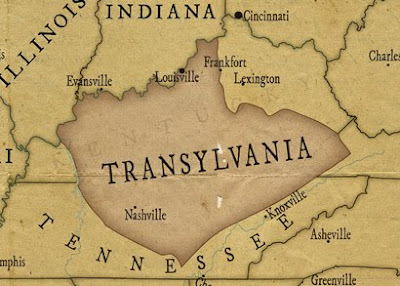 It's true, Transylvania was the proposed name of a state that overlays much of Kentucky and Tennessee. This quite-serious statehood proposal was originally the idea of Daniel Boone. And yes, Boone was a real person, while Dracula and the Wolfman are not.... I hope. The full story is explained in Lost States--now available for pre-order (at right).